On the occasion of the final day of the NAO Performing Festival 2011, the show by Anish Kapoor in the Fabbrica del Vapore, Milan, hosted Dancing Dreams – Sui passi di Pina Bausch, a tribute to the great German choreographer who revolutionized contemporary dance. It was organized by MADEINART and by P.F.A. Films. 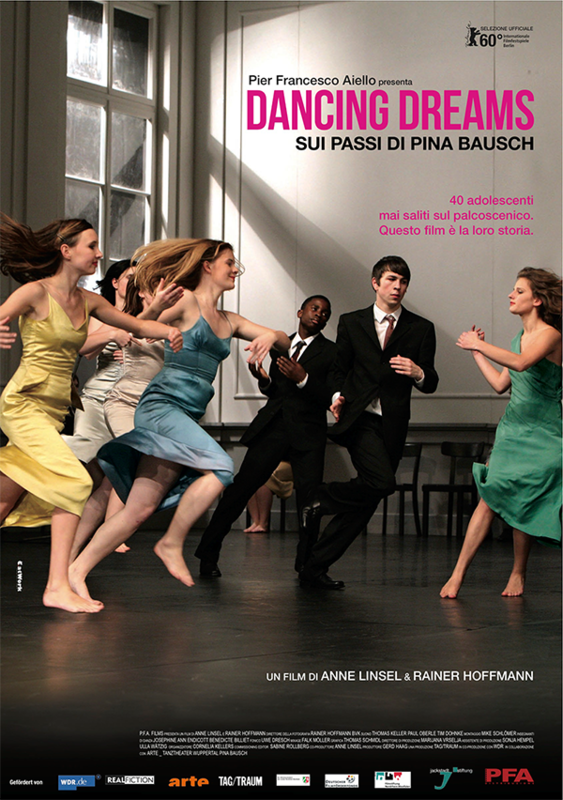 Dancing Dreams – Sui passi di Pina Bausch is a documentary film directed by Anne Linsel and Rainer Hoffmann and it is a tribute to the art of the extraordinary German choreographer, one of the founders of dance theatre. The film centres on the staging of a show by Pina Bausch in 2008, just a few months before her death, with her extremely young dancers. It was screened as a special event at the 60th edition of the Berlin international film festival and was warmly received by both critics and public. In fact the documentary, besides transmitting the fascination of an art that has captured thousands of spectators, gives an intimate and revealing portrait of one of the greatest personalities in the world of dancing. The film was preceded by an introduction to the work of Pina Bausch and the screening of the documentary Sotto una luna piena – omaggio a Pina Bauch, realized by Davide Ferrazza and produced on the occasion of the show Vollmond di Pina Bausch interpreted by the Tanztheater Wuppertal on February 2011 in the Piccolo Teatro, Milan. In an interview Pina Bausch said that at the beginning of her career she found herself at a crossroads: she could either follow a preordained career or else follow a new path, one that was dark and unknown and in which the only light for illuminating it was faith in herself and her own capacities. This was why the decision was made to pay tribute to Pina Bausch during the exhibition of Dirty Corner. This piece has many ways of being read; one of these is to consider it as a metaphor for artistic initiation where, even though the unknown plays a major role, there is no need for outside help in order to lighten the road ahead but only an interior light as a guide to one’s own footsteps. The screening took place in the “Cattedrale” area of the Fabbrica del Vapore where Anish Kapoor’s monumental Dirty Corner was exhibited. This was organized by the Milan city council and by MADEINART. Curated by Gianni Mercurio and Demetrio Paparoni, it was on view until 31 January 2012. Anish Kapoor’s installation and the screening could be seen for the inclusive price of €6.